Which generation is most emotionally intelligent? According to the world’s largest study on EQ, Six Seconds found that EQ (Emotional Intelligence) increases with age. Older generations score higher on emotional intelligence assessments than each successively younger generation – and as a result: form stronger relationships, perform more effectively at work, and achieve higher wellbeing. The short answer: Boomers. Followed by Gen X, and then Millennials. But the most fascinating part of this research into age and emotional intelligence is about the specific EQ skills that make up someone’s emotional intelligence and each generation’s relationship to them – the strengths and challenges, blind spots and hard won lessons – of each age group tell a more nuanced story about how well we can work and live together. Are Millennials more focused on purpose, as commonly thought? Are Boomers stuck in their ways, or do they have a unique ability to empathize? Let’s take a closer look at the details of age and emotional intelligence – and what it means for each generation’s outlook. The average emotional intelligence score, broken down by generation, increased significantly as people got older. Previous research had found a slight correlation, but this latest research confirms the old adage that wisdom really does come with age. As people gain life experience, they learn these soft skills that are essential to navigating life’s ups and downs and achieving personal and professional success. AND IT’S LEADING TO BETTER DECISION MAKING. One unique aspect of Six Seconds’ emotional intelligence assessment, the SEI, is that it not only measures emotional intelligence, or EQ, but also life outcomes like decision making. This research confirmed what many people already suspect: high emotional intelligence predicts good decision making. Again, the Boomers took 1st place, followed by Gen Xers and then Millenials. In fact, those who scored in the high EQ category were 10x as likely to have a high decision score; that is, way more likely to make good decisions. Breaking from Millennial stereotype (usually based on US data), global research shows they are not as mission-driven as Boomers. Rather, purpose becomes more important as people age. 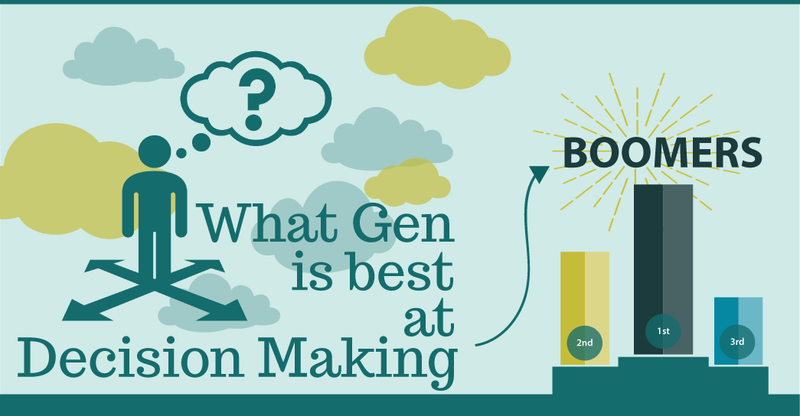 Much has been written about how Millennials are the purpose driven generation. They don’t want money just to work some meaningless job. They want meaning. “Being a part of something bigger than themselves and finding purpose driven lives in the workplace are hallmarks of the Millennial generation,” proclaims Talent Daily. “Give them purpose, not an assignment,” says Entrepreneur, before citing a survey that found that 84% of millennials say that making a difference is more important than professional recognition, and 92% believe businesses should be measured by more than their profits. 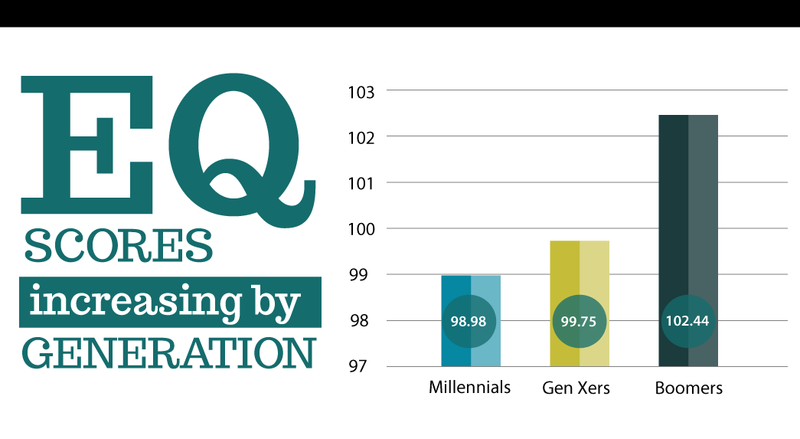 Unlike older generations who are seen as willing to simply fall in line, Millennials want to know why. At least that’s the story. But new research says almost exactly the opposite. Pursuing noble goals, the EQ skill of integrating your everyday actions with a bigger purpose, had the biggest discrepancy between generations out of the 8 core emotional intelligence competencies. Boomers (age 54-72) scored the highest, while Millennials (age 22 – 37) scored the lowest. And recent research from LinkedIn confirmed this finding: a global survey of 26,00 employees worldwide found Millennials to be the least purpose-driven generation. In that survey, employees ranked the importance of the employment attributes of money, purpose and status. And they found that a sense of purpose became more important as people got older: 48% of baby boomers prioritized purpose over pay and titles, followed by Gen X (aged 38-53) at 38%, and finally, millennials at 30%. Research by psychoanalyst Erick Erickson has found that younger people tend to focus on more immediate priorities like finding a stable income and life partner, establishing a home, and starting a family. Finding and following purpose may seem like an abstract, intangible goal, and too outwardly focused. Seen from the perspective of the arc of life, this also makes sense. Teenagers are biologically wired to be self-absorbed and make decisions based on short-term criteria, and it’s possible that Millennials are still growing out of this mindset, at least compared to the older generations who have really cultivated it. Focusing on establishing a home and starting a family is by itself a more outwardly focused venture than focusing solely on oneself (ahem, teenagers), and it seems that this process of expanding focus keeps going with age.Older generations, according to Erickson’s research, tend to think the most about their contribution to society, which, naturally, prioritizes purpose. But… the research from Six Seconds indicates that Millennials would be well served to focus on purpose at an earlier age. The same dataset found that pursuing noble goals predicted 62% of the variation in good decision making, which undoubtedly contributed to the older generation’s higher decision making scores. Long-term thinking tends to lead to better decisions than short-term thinking. It’s like a GPS for life. If you know where you want to end up (what you want to contribute / change in the world), that can be used as a guide for all types of decisions along the way. It may seem abstract, but in reality finding and following purpose has tangible, measurable effects. Millennials have an opportunity to focus on this skill and reap the benefits. Pursuing Noble Goals is like a GPS for life when it comes to decision making. It’s time to rethink the common assumption that young people are more purpose driven than older people. According to the data, it simply isn’t true. While this first finding flies in the face of conventional wisdom, this second finding in many ways upholds a popularly held belief. It’s about what Six Seconds calls Brain Apps, and which ones – the emotional, rational, practical, or idealistic – each generation is most likely to use. It’s another fascinating nuance of age and emotional intelligence. Emotional Insight is one the Brain Apps Six Seconds identified through consultation with leaders, change experts, and a huge dataset of over 60,000 emotional intelligence assessments. There are 18 Brain Apps, which are capabilities that people use to thrive in different aspects of life. It looks at what your brain likes to do and what functions are easy and smooth for your brain. Examples include Adaptability, which is the ability to accept multiple perspectives, Critical Thinking, which is the ability to evaluate, assess and plan, and Connection, which is the ability to sense and mirror others’ emotions. For an in-depth look at the 18 Brain Apps, you can download a beginner’s guide below. Not surprisingly, it turns out the generation in which a person grows up plays a big role in which of these capabilities they are likely to have developed. Understanding each age group’s general strengths and challenges opens the door to working better together, or as a leader, working effectively with everyone. And these are learnable skills, so to be challenged in one, as an individual or an entire generation, simply means that it hasn’t been cultivated yet. Once again the dataset looked at 3 age groups: Millennials (22 to 37), Gen X (38 to 53) and Boomers (54 to 72). Gen X and Boomers had remarkably similar results in terms of Brain Apps. They reported struggling the most with Emotional Insight, Connection, and Collaboration, which are all related to people, emotions and human dynamics. And at the same time, the strongest Apps for these generations were Prioritizing, Data Mining and Critical Thinking, which are all related to assessing data, mapping out logical possibilities, and planning. If you’re a Gen Xer or Baby Boomer, you’re most likely to struggle with emotional insight, connection, and collaboration. Does that fit you? At least in the world my Dad and Grandpa grew up in, this makes a lot of sense. You simply didn’t talk about feelings. Emotions were seen as the toddler of the brain that interfered with logical reasoning. And naturally, as a result, they developed capabilities related to logical reasoning, and not the emotional dynamics among people. We know now that one isn’t more important than the other. They are both really important. But there is a clear generational bias toward valuing logic over emotion. Millennials, on the other hand, struggled most with Critical Thinking, a strength of both Gen X and Boomers. In fact, the largest difference of any Brain Talent between the generations was Critical Thinking. According to a recent study by MindEdge, a learning company founded in 1998 by Harvard and MIT educators, many millennials lack critical thinking skills. Nearly half of the respondents for the study got an F on a quiz designed to measure critical thinking skills. This could be due to something about the world Millennials grew up in. The common narrative is that growing up coddled by parents in a world where ‘everyone gets a trophy’ has resulted in a lazy, entitled generation that lacks critical thinking skills. But it could also be the result of simple life experience, not some innate characteristic. 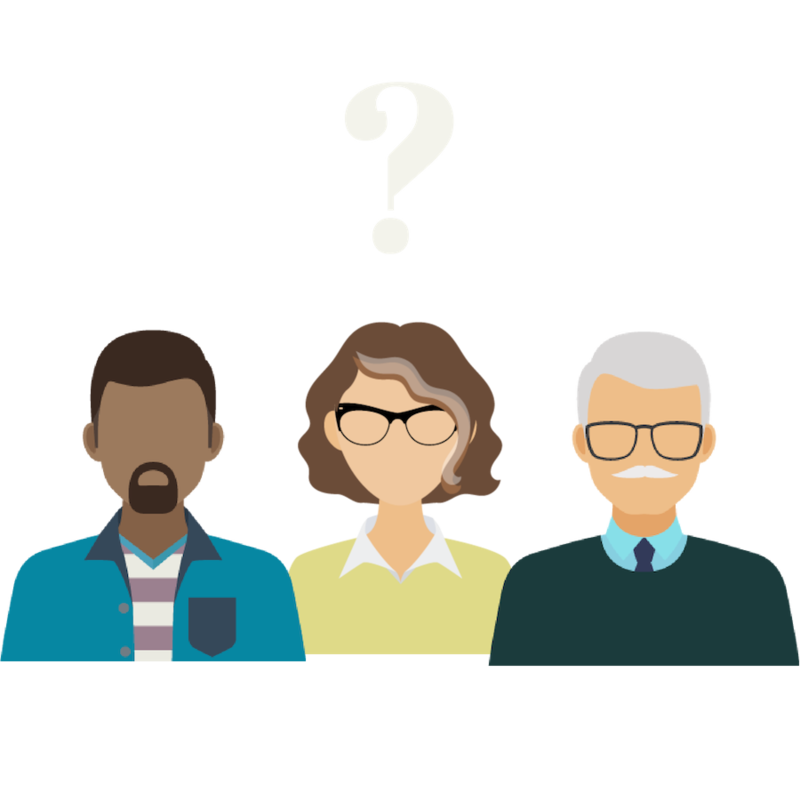 Critical Thinking is the ability to assess a situation and apply your previous insights to make a good decision, a skill that older people have naturally had a lot more practice at than younger people. Another struggle for Millennials is Vision, which is seeing the long-term meaning. That fits with the data we looked at related to purpose. As a leader, understanding these nuances of age and emotional intelligence can help you gain insight into the potential strengths and challenges that different age groups may bring to the table. 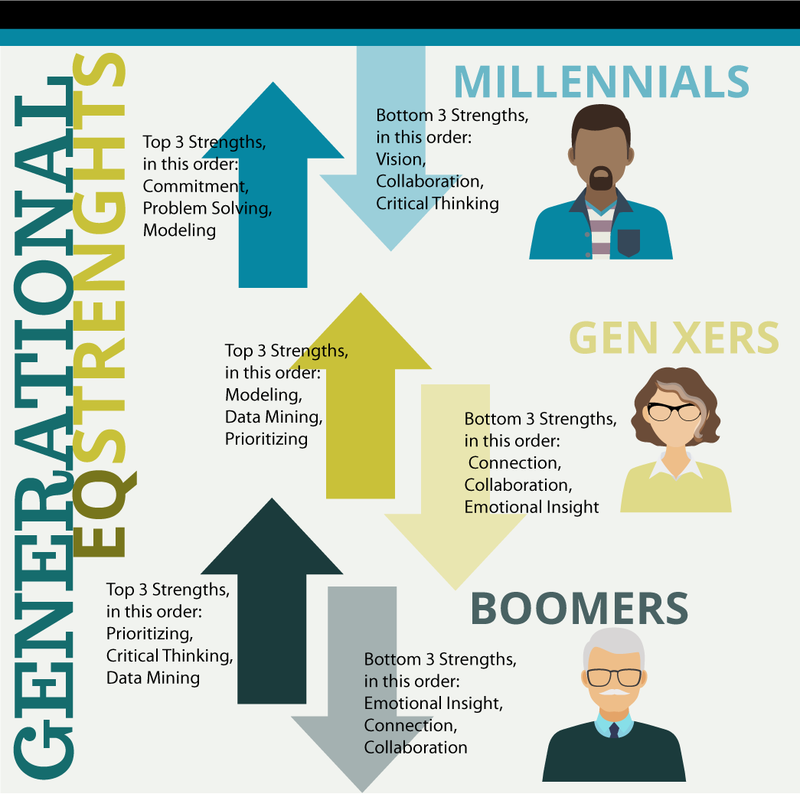 Understanding each Generation’s EQ strengths and challenges opens the door to working better together, or as a leader, working effectively with everyone. The good news is that, like all emotional intelligence competencies, Brain Apps can be cultivated and strengthened through practice, at any age. To understand this let’s take a sneak peak at the beginner’s guide, which offers tips for strengthening all the Brain Apps. Six Seconds’ SEI assessment, which reports on the Brain Apps and the eight emotional intelligence competencies, has been used by organizations all over the world to improve their hiring and training processes. One of the tools is called a Dashboard, an overall look at a group’s top and bottom Brain Apps, which provides invaluable insight into the group’s strengths and weaknesses. Click here to learn more about the SEI — or better yet, try it yourself with the Brain Brief Profile. 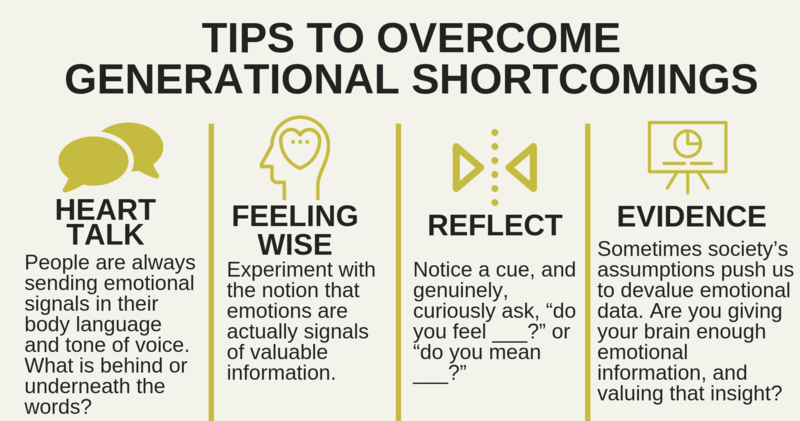 Whether it’s worldwide or within an organization, these tools and methods provide invaluable insight into emotional intelligence and how to leverage it for optimal results (here’s evidence). There is a positive correlation between age and emotional intelligence. Older generations tend to be more emotionally intelligent than younger generations. But are Boomers and Gen Xers finding more personal and professional success as a result of their higher EQ? The SEI measures life outcomes: effectiveness, relationships, wellbeing and quality of life. Data suggests emotional intelligence increases with age, as does stronger relationships, sharper effectiveness, and higher wellbeing and quality of life. Boomers scored the highest on all of these life outcomes, followed by Gen X, and then followed by Millennials… with really only one exception. The quality of life outcome breaks down into two subcategories: achievement and satisfaction. QOL Achievement measures one’s capacity to accomplish meaningful goals. QOL Satisfaction measures one’s capacity to feel appreciation about one’s life and efforts. 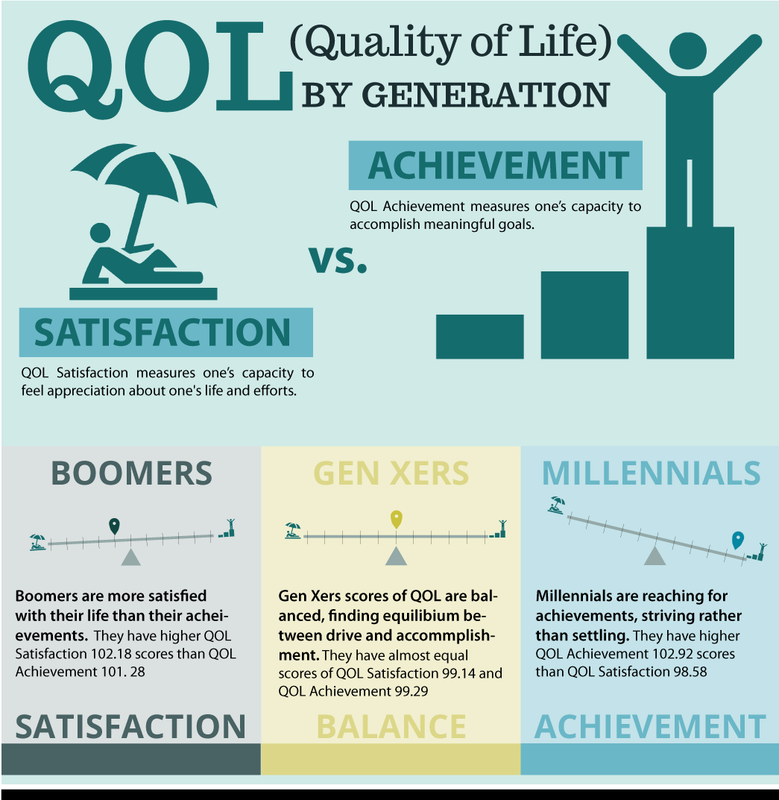 Millennials scored higher on QOL Achievement, while Boomers scored exceptionally high on QOL Satisfaction. This fits in neatly to the discussion above on purpose, long-term perspective, and each generation’s focus. Boomers can look back with appreciation on everything they have accomplished, while Millennials are still very much in the thick of accomplishing those big goals. Which generation is most emotionally intelligent? Six Seconds’ newest research looks at age and emotional intelligence– and the strengths and weaknesses of each generation. But the overall trend holds. Emotional intelligence increases with age, and with higher EQ comes a host of benefits for how well you take care of yourself, perform at home and at work, and build relationships. It’s important to remember, though, that while EQ increases with age, these are learnable skills that anyone can learn, anytime. There are some young people with higher EQ then their older counterparts. The sooner you learn them, the quicker you start reaping the amazing benefits. Ready to grow your EQ? Check out this guide.